SANTA CLARA, Calif. (KGO) -- San Francisco 49ers quarterback Colin Kaepernick is getting more support ahead of the official kickoff to the season for the team. The game will air on ABC7, but the big unknown isn't the outcome. It's whether more players will join Kap and his national anthem protest. In the locker room, nobody is taking sides, at least not publicly. But CEO Jed York has aligned himself now with Kap - each are donating $1 million to help address social injustice. And Coach Chip Kelly thinks what both are doing are a good thing. It's becoming clear that Kaepernick and York are on the same team. On the field, of course, but they're also now joined at the hip with each making $1 million commitments to address social injustice and inner city relations with police. Denver Broncos linebacker Brandon Marshall has joined the movement. He and Kaepernick have college ties. And just before practice Friday morning, Kelly told ABC7 News he's embracing what Kap and York are doing. "I think any time there's a conversation about injustice in this country, I think it's a positive thing," he said. "And now, instead of just a conversation, take it a step further like both Colin has done and Jed has done, I think is a positive." Kaepernick turned down interviews on Friday, but Niners safety Eric Reid, who joined the quarterback on his knee in San Diego, is glad to see support for what they're doing. "It means a lot when our team supports us in the effort we're trying to bring awareness to," he said. "I haven't had a chance to talk to Jed since they made that announcement, but I'll be sure to tell him I'm thankful and grateful that he's willing to do that." 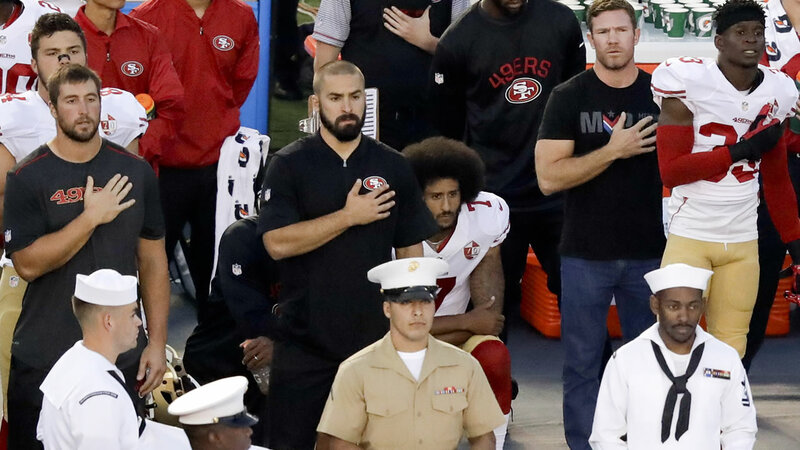 No one is willing to say what will happen Monday night during the national anthem. "Guys are doing a great job of keeping it personal and no one said anything if a guy did decide to take a knee," said 49ers linebacker Navorro Bowman. "We're just trying to stay focused on what's important, and that's winning games." Reid admits there is a risk for protesting. He might lose his one and only product endorsement. But if that happens, he says he's not going to worry about it. Click here for full coverage on Colin Kaepernick, and click here for more stories and videos on the 49ers.